So... I moved to LA! Yayyyy! It's something we've always wanted to do, and though I'll miss my friends in SF dearly, I'm excited to be in a place where I'm surrounded by creativity and great artists day in and day out. One of the first things I did as we started unpacking was set up the Christmas tree. Cats immediately took a liking to it. Unpacking is fun and terrible at the same time. I always love the nesting process, but I feel like you find things you have no idea what to do with and you always end up just throwing away a lot. We're slowly getting settled into our beautiful new apartment, and finally got a chance to put some of our fave artwork up. 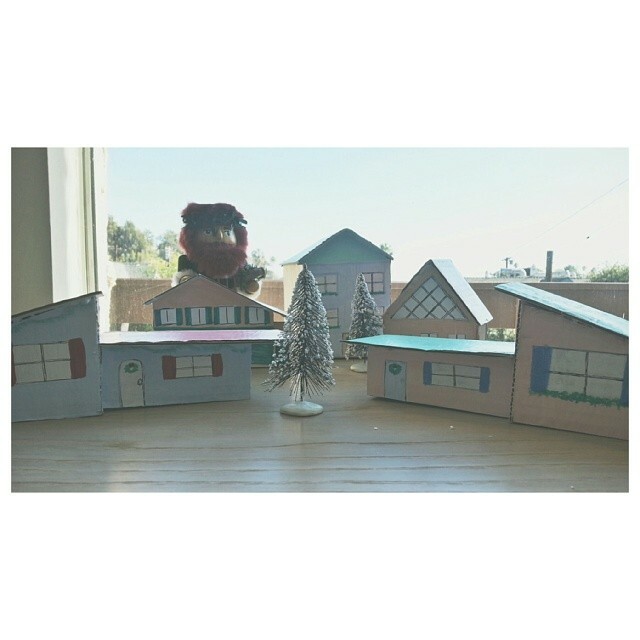 And because I'm crazy, I put some of the cardboard boxes to good use making my own little mid century Christmas village. Mr. Rockit says it looks like the Simpson's homes. I'm ok with that. Though I'm still unpacking and settling in, I'm doing a little Christmas craft here and there, do you have any favorite holiday diys?